"SpinZone TradeShow Edition truly delivers the engagement a live audience is drawn to through using gamification strategies designed specifically for trade shows." Contest Factory Founder, Dr. Iman Foroutan. 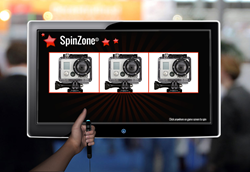 Contest Factory is proud to announce the release of SpinZone Trade Show Edition. This makes SpinZone Trade Show Edition available not only to marketers but also trade show logistics organizations and venues to offer as a product/service for resale. At its core, SpinZone Trade Show Edition was designed to give marketers a highly engaging platform utilizing gamification tactics to attract prospects to their booth for lead generation. This tool not only attracts prospects but creates a word-of-mouth buzz on the trade show floor, making it a must-see attraction.